• Protection from heart attack and stroke. • Lowers triglycerides, LDL and increases HDL. • Helps maintain healthy joints. • Key component of the brain and eye. • Important in the growth and development of the foetal brain during pregnancy. • Improves skin and eye health. • Helps in psoriasis and eczema. • Provide lubrication to the skin, arteries, veins and intestinal tract. • Helps in reducing depression. • Helps maintain normal blood sugar levels. • Helps in Reducing breast, colon and prostate cancer. A.Omega-3 is an essential fatty acid (EFA), also known as a polyunsaturated fatty acid (PUFA). 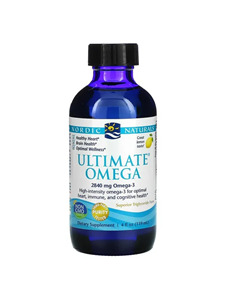 It is derived from both animal and plant sources, although Omega-3 from fish oil is the most common supplemental form. Fatty acids form the main useful fraction of fats and oils and are necessary for overall health. Because your body cannot manufacture essential fatty acids, you must get them from food or supplemental sources. Plant sources such as Flax Oil contain the parent Omega-3 fatty acid called Alpha-linolenic acid (ALA). The human body hardly converts ALA to the longer chain fatty acids EPA and DHA, which are used for prostaglandin formation and other cellular needs. Fish Oil contains the desired Omega-3 fatty acids in their more useful EPA and DHA forms. ALA requires enzymatic conversion to generate EPA and DHA. A. Cooking with fish oil would be expensive and would not be effective as the fatty acids would rearrange their molecular structure at high temperatures.